A tough competitor for the ever-popular golden drama queen Forsythia, in terms of bright yellow color, Winter Jasmine (Jasminium nudiflorum) is a slender deciduous shrub with arching evergreen shoots and dark green leaves that produces clusters of beautiful yellow flowers long before the first signs of spring have begun. But be careful where you grow it! Winter Jasmine can be hard to stop once it gets going and must be carefully pruned back to maintain its presence within the desired space. All extended trailing vines will take root wherever they meet the ground, and can stretch more than fifteen feet in any direction. Before long your entire yard will be covered in little yellow flowers if left unattended! Which isn’t necessarily a bad thing if that’s the look you’re going for. Conversely, however, this particular rooting habit, size, and growth style actually make this plant an ideal tool against erosion for steeper inclines, as well as a great option for arbors, trellises, and wall cascades. Winter Jasmine (Jasminum nudiflorum) is native to Northern China, grows in zones 6-10, reaches a height of 4-7 feet when unsupported (10-15 feet supported) with a spread of 3-6 feet, prefers moist well-drained soils, flourishes best in full sun to partial shade (but can tolerate heavy shade if need be), blooms yellow in late winter to early spring, works well as a groundcover, hedge, screen, or trellis specimen, has no noticeable fragrance, and takes root wherever the trailing vines touch ground. Do you want tons of cheerful yellow flowers on graceful evergreen shoots when almost nothing else is blooming? An attractive reminder of continued life, spring, and rebirth during the dreariest of winter months? Then try Winter Jasmine. It will bring great joy and exuberance to your landscape long before your neighbor’s plants begin to bloom! 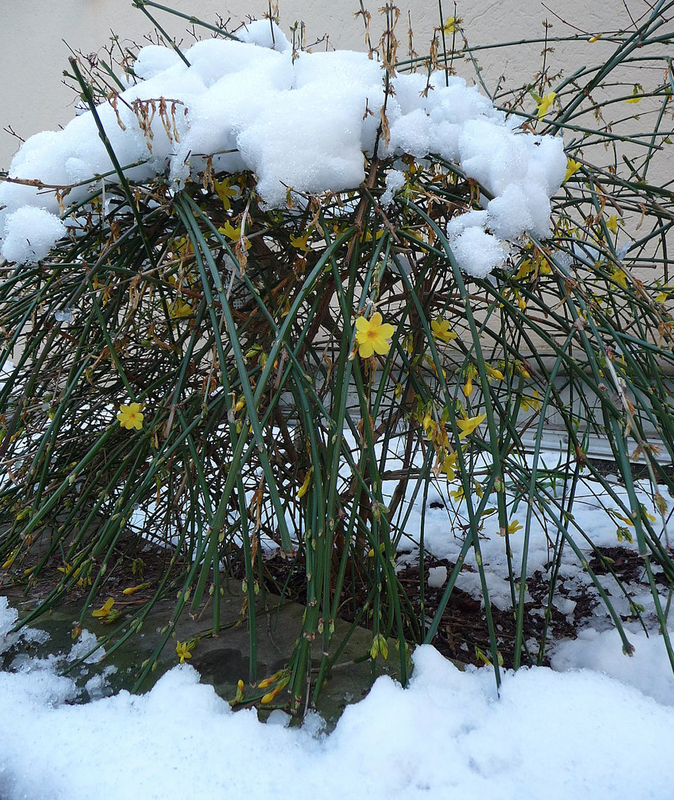 To find out how Winter Jasmine can fit into YOUR landscape, call us today at 703-679-8550 to set up a personal consultation. Want to buy Winter Jasmine in Virginia?